Here at Splintered Forest, we love trees and the outdoors and we know you do too! That is why we want to help you protect the landscape that you work so hard to maintain. Whether you have issues with the Emerald Ash Borer (EAB), deer eating your plants or need assistance with proper watering, Splintered Forest’s team of Licensed Applicators (with the Colorado Department of Agriculture) can help with all of your Plant Health Care needs! The IPS/Mountain Pine Beetle Spray is a trunk based, 60-day spray that is applied to Evergreen trees to help manage an assortment of beetles and insect. Splintered Forest recommends that the IPS/Mountain Pine Beetle Spray is applied two to three times a year. In addition to the IPS/Mountain Pine Beetle Spray, it is imperative that the tree is watered (including watering during the Winter) and fertilization is recommended twice a year. 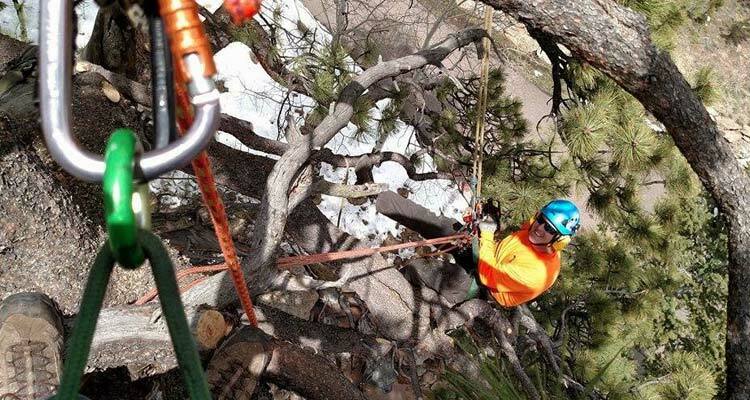 Contact the Splintered Forest crew today for a free assessment of your trees. Emerald Ash Borers are a small Beetle that feeds on Ash trees and are causing destruction across the United States. At Splintered Forest, we recommend trunk injections because they have the longest residual effect and have over a 96% efficacy rate. We recommend applying once every two years in the early Spring. While treatment of Emerald Ash Borer is possible, prevention is crucial to protecting your Ash trees from EAB. Contact Splintered Forest’s team of professionals for more information about protecting your trees or to schedule your free Plant Health Care assessment. For more information about the Emerald Ash Borer, visit BeASmartAsh. We understand that as a homeowner, deer can pose quite a challenge when trying to protect the landscape you work so hard to build. It can be costly to continually replace the items they consume so why not safeguard them instead? The deer repellent treatment program is designed to help deter deer from flowers and shrubs in the urban landscape. The treatment is organic, leaves no spray residue and can be done all year long. If you are interested in protecting your landscape, let Splintered Forest tailor a program unique to your landscape. Contact our crew today for a free estimate! Water is essential to the survival of your trees – in Colorado trees need an average of 2” of water each month! Deep root watering allows water to be delivered directly to the basal roots of the tree, the area that needs it most. Traditional watering methods such as a garden hose only allows for the surface area to get wet instead of delivering that much needed water directly into the ground. Splintered Forest’s organic/nutrient based watering programs are offered year-round. We incorporate Essential Plus Root Stimulators with our water that help with uptake. Watering the surface of the ground gives the water a chance to evaporate before ever reaching the root system - deep root watering will save you both time and money! If roots are able to get adequate water on the surface, they aren’t encouraged to reach deeper for that water supply – this won’t allow for the root system to grow strong. Shallow roots can quickly dry out and die if exposed to heat and drought conditions. Systemic soil injections or drenches are applied to the feeder and basal roots of the tree. These treatments last for one full season and tackle an array of insects and micro-organisms such as Emerald Ash Borers (EAB), Lilac Ash Borers, Kermes Scales, European Elm Scale and more. Systemic injections are ideal for treating trees around water sources, windows or any other environmentally sensitive areas that traditional spray methods may pose a risk. Aphid and mite control applications are applied via spray, trunk, or soil to alleviate Aphids and Mites. These applications are offered year-round to lower the population of these insects.